The history of Oktoberfest lies in the marriage of Crown Prince Ludwig and Princess Therese of Saxony-Hildburghausen back in 1810. Thanks to decades of transformation, the Oktoberfest celebration and its menu have taken on a new light. Today, Oktoberfest is more a celebration of the marriage of German beer and food than prince and princess. To do justice to this tremendous festival that has brought us such incredible German food and beers, custom design your Oktoberfest menu to bring out the best flavors in each bite and sip. Ripe with tradition but a product of years of innovation, let’s take a look at the top Oktoberfest food and beer pairings. With nearly no bitterness and just a gentle undertone of banana and clove, Hefeweizen Light perfectly complements a light and refreshing salad. Just the starting point to your Oktoberfest menu, let guests ease into your festival atmosphere and beer extravaganza with a healthy bite and light beer. The meat in this pot roast is marinated for days to make it incredibly tender, flavorful, juicy and ready to be cooked into one of Germany’s national dishes. With so much significance and effort attached to this dish, it is only right to enjoy it with an equally respected beer. Fortunately, it pairs perfectly with one of Germany’s most popular ones—Kölsch. Brewed in Cologne, this clear, top-fermented beer has a bright straw-yellow color that perfectly depicts the hue Oktoberfest beers have taken on over the years. Celebrate the past and the present together with this delicious duo. 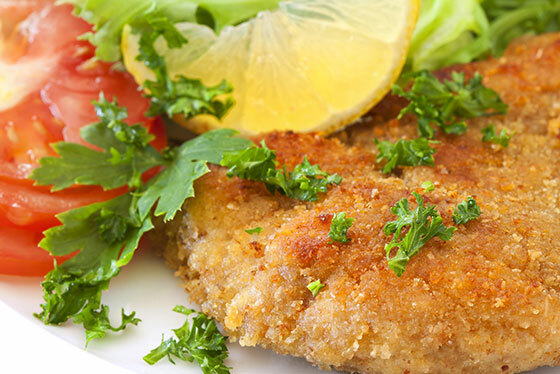 Breaded and pan fried, you can’t go wrong with this incredibly popular Oktoberfest comfort food. Likewise, Hacker-Pschorr’s flagship style Weisse is a sure hit. 60% malted wheat and 40% malted barley—this medium-bodied beer proves that sometimes the staple is the best fit. 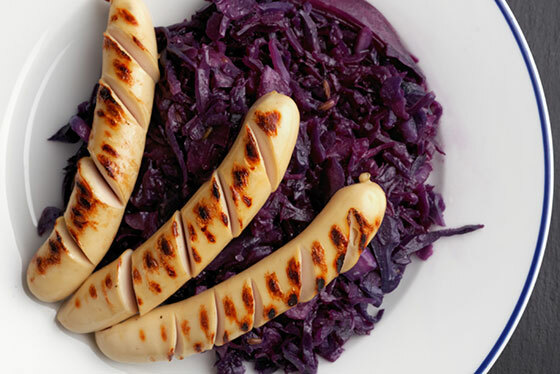 This plump sausage from North Germany just begs for a strong dark beer like the Hacker-Pschorr Weisse Dark. Ripe with old Munich tradition, this rich beer is as lively as your Oktoberfest party. It’s so refreshing and intriguing, don’t be surprised if guests stay at your Oktoberfest celebration a few extra hours. Everyone loves a good traditional bratwurst, and even more so when paired with an amber that doesn’t stray far from those enjoyed in 1810. 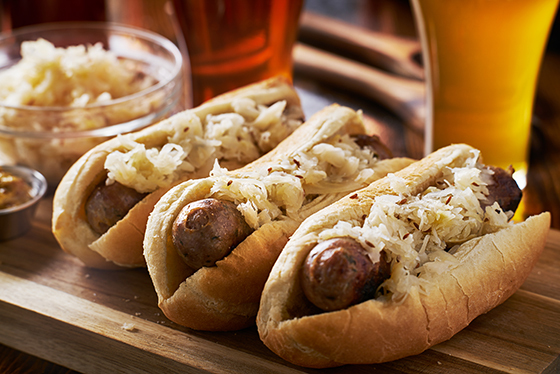 Robust and toasty—Oktoberfest beers’ malty sweetness perfectly complements bratwursts fresh off the grill. In each bite and sip, guests will find an energizing component that drives your party to greater heights. Intrigue guests to diversify their Oktoberfest meal this year with boneless chicken in wine sauce. Such a gourmet offering is not always found at Oktoberfest parties. But pair it with Shiner Oktoberfest, and it will soon be a crowd favorite. With one of the strongest malt flavors and hop aromas, Shiner Oktoberfest will entice guests to try this tender and flavorful entrée. Braising creates a sweet caramelization that pairs perfectly with the hearty malts that the Sam Adams Octoberfest is known for. Topping the charts of popular craft beers, this is one guests will be quick to snag at your Oktoberfest party. And the deep, smooth flavor will have them coming back for many more. Perfectly cooked potato pancakes have a sweet, crispy crust and soft inside. Look for an equally complete beer to create the perfect pairing. The Firestone Walker Oktoberfest is the ideal balance—sweet yet dry and earthy. It has a finish just as snappy as the outer layer of our cooked potato pancakes and pairs nicely with traditional toppings like applesauce. 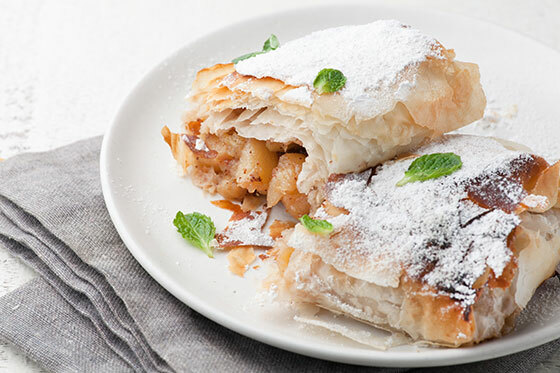 So delicious on its own, our apple strudel only needs a light bodied and crisp beer to be complete. The wonderful caramel and toast of the Hacker-Pschorr Oktoberfest-Märzen puts it right at home among the best Oktoberfest desserts. What a sweet ending to your Oktoberfest menu. Although we can’t credit centuries of innovation to our incredible cuisine, we can thank 60+ years of experience. Just like Oktoberfest celebrations, we have had plenty of time to perfect our menus. 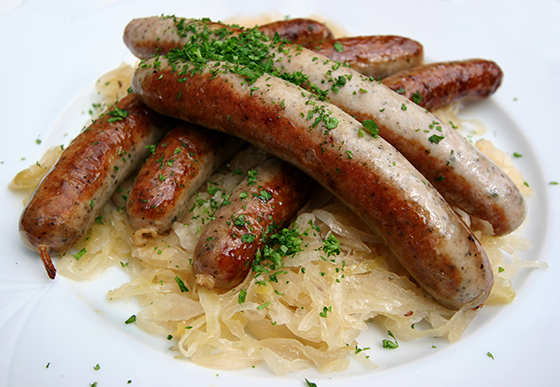 Want to bring our delicious German food and unparalleled service to your Oktoberfest party? Contact us online or give us a call at 866.522.7873. Oktoberfest Planning is Happening Now!